The badgers may affect soil chemical properties and plant species composition in two ways: by digging burrows (topsoil mixing) and by using latrines (fertilized soils). Here is reported which kind of badgers’ activity plays a major role. Soil samples for pH, total N, NH4+, NO3− and data concerning plant species composition were collected on circular plots (N = 80) on burrow mounds, latrines and reference areas. Burrow mounds were characterized by higher pH and lower content of total N. The content of NH4+ − main component of manure, was higher in latrines than on mounds, whereas in the case of mounds, the content of NO3− was higher than in latrines. There was higher plant species richness on the burrow mounds than on the other plot types. Also plant species characterized with traits allowing them to settle on disturbed habitats were recorded at a higher number on burrow mounds. CCA analysis distinguished only one herbaceous plant aggregation associated with burrow mounds. The presence of latrines with high rate of nitrogen input did not affect plant species composition due to a low rate of soil mixing. Soil chemical properties and flora changes showed that badgers shape plant communities not by fertilization with excrements but, as a result of digging activity, by altering topsoil conditions. Plant species composition is closely connected with soil conditions which can be expressed as nutrients content. 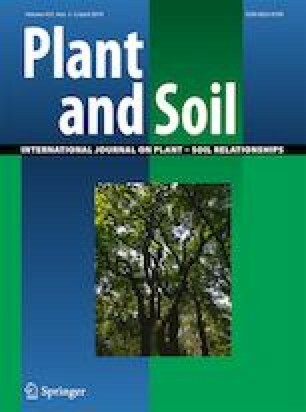 Nutrient content and its availability for plants may be influenced by soil disturbance generated by digging animals (Canals and Sebastiá 2000; Kurek et al. 2014a, b; Platt et al. 2016). Digging animals beside soil mixing may also provide straight nutrient input with their excrements (fertilization) and thereby changes in plant communities may occur (see: Schnoor and Olsson 2010). Soil mixing causes the release of nutrients through acceleration of litter decomposition (Goszczyńska and Goszczyński 1977; Hobbs and Mooney 1985; Wilson and Tilman 1993; Canals and Sebastiá 2000; Eldridge and Myers 2001; Kerley et al. 2004; Borchard et al. 2008) and for this reason disturbed places may act as nutrient “hotspots” which creates changed resource supply for plants (Hagenah and Bennett 2013). Local activities increase environmental heterogeneity by opening space and altering the microhabitats (Semenov et al. 2001; Guo et al. 2012). It is well known, that soil pedturbation has a number of effects on plant species communities, being the reason for the increase in plant species richness (Schnoor and Olsson 2010) by changing the representation of some plant strategies, i.e. the share of therophytes and geophytes (McIntyre et al. 1999, but see: Gómez-Garcia et al. 1995). A common finding is that such patches promote growth of annuals (Kinlaw 1999; Obidziński and Głogowski 2005) and decrease interspecific competition making free space for new species to establish (Wilson and Tilman 1993; Kinlaw 1999) and enriching species diversity (Canals and Sebastiá 2000; Kurek et al. 2014a, b). Badger is a medium-sized carnivore dwelling extensive burrows called “setts” inhabited for several years (Kowalczyk et al. 2004). Badgers’ setts are characterized by huge amounts of excavated soil which volume reaches up to 28 m3 and covers up to 970 m2 or even more (Neal and Roper 1991; Matyáštík and Bičík 1999; Obidziński et al. 2013; Coombes and Viles 2015). In ecosystem badger plays also an important role in prey-predator interactions i.e. with European hedgehogs (Erinaceus europaeus L.) (Trewby et al. 2014). Its extensive and durable setts may act as safe places for many other animals for breeding or temporary shelter (Hancox 1988; Sidorchuk et al. 2015). Badger is also reported as an effective seed disperser (Fedriani and Delibes 2009; Kurek 2015). Many authors reported that setts are places of higher plant species diversity (Van Wijngaarden and van de Peppel 1964; Stubbe 1965; Neal and Roper 1991; Neal and Cheeseman 1996; Obidziński and Głogowski 2005; Obidziński and Kiełtyk 2006; Kurek et al. 2014a, 2014b; Kurek and Cykowska-Marzencka 2016). Some authors supposed that it is the effect of fertilization with feces (Van Wijngaarden and van de Peppel 1964; Stubbe 1965; Neal and Roper 1991; Neal and Cheeseman 1996) but there was no evidence supported with chemical analysis of soils. Kurek et al. (2014a, b) presented chemical characteristics of burrows’ soils and stated that the crucial factor shaping plant communities on burrows is the extensive disturbance of the topsoil instead of fertilization by animals. Badgers are known to deposit manure in latrines, which are funnel-shaped pits characterized by high inflow of urine and feces accumulated all over the year (Hutchings et al. 2001). These animals are well-known for marking their territories with urine and feces (Kruuk 1978) and also with glandular secretions (Buesching and Macdonald 2004). 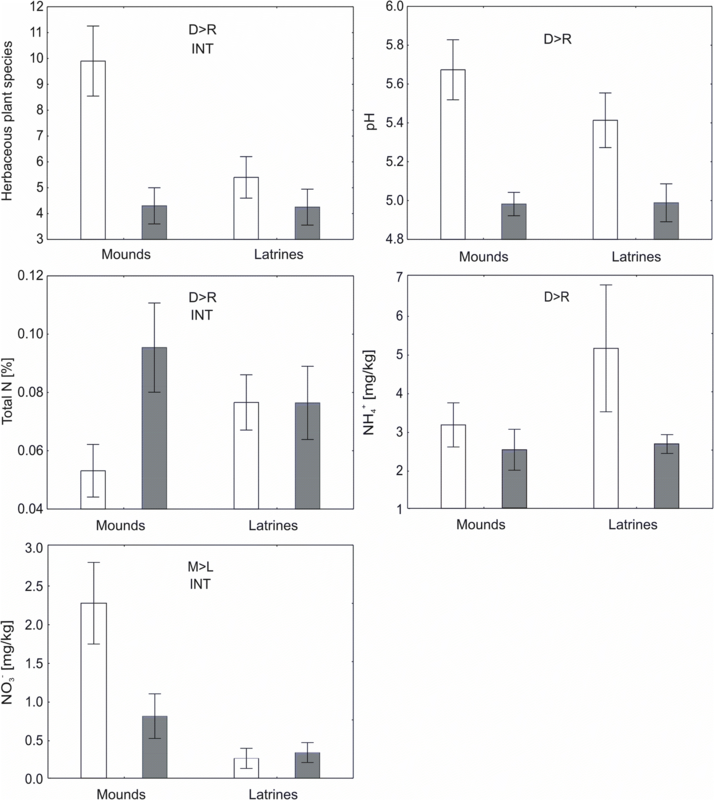 A substantial part of the animal manure may be deposited in latrines localized on borderlines of their territories (Roper et al. 1986; Hutchings et al. 2001), scattered throughout their territory (Roper et al. 1986) and also in close vicinity of their burrows (Neal and Roper 1991; Hutchings et al. 2001; Kowalczyk et al. 2004) or even inside burrows (Roper 1992). The location of latrines on the heaps of excavated soil on the entrance to the setts is extremely rare (Kurek P. – pers. obs.). However some authors reported badgers marking on mounds near the entrance to their sett with urine (and even with feces) (Roper et al. 1986; Buesching and Macdonald 2004). A question arises: is the fertilization really a relevant cause of higher plant species diversity on badgers’ setts? If so, two conditions should be fulfilled. First, the content of nitrogen in burrow mounds should be higher than in adjacent areas. Kurek et al. (2014a) revealed that the content of total nitrogen was lower on burrow mounds in comparison to undisturbed reference plots. This research goes farther and beside total nitrogen it focused also on NH4+ and NO3− content in topsoil. Second, plant species richness on the latrines, where fertilization is high, should be significantly higher than on adjacent areas. In the surroundings of latrines the soil is almost intact (excluding pits) but instead they are supplied by urine and feces (fertilization). Therefore, unlike burrow mounds, badgers’ latrines are places with high rate of fertilization and low rate of soil mixing. Some authors reported that pits created by many mammal species are the best places for seed germination and seedling establishment (James et al. 2010). Foraging pits also differ in chemical and physical conditions of soil and microclimate (Eldridge and Mensinga 2007; Eldridge and Whitford 2009). Some authors (Eldridge and Whitford 2009) suggest, that more favourable conditions for plant establishment in pits (probably also in latrine/dung pits) may result in higher plant species diversity. Thus, the activity of badgers in the ecosystem is manifested by digging extensive burrows/setts (soil-mixed areas) and using latrines (fertilized areas). In comparison to setts, latrines do not seem to be plant species diversity focal place and there is no data concerning this phenomenon. Temperate regions of Europe lack information considering changes in plant communities in the vicinity of badgers’ latrines. There are also no comprehensive studies on the differences in plant species composition and in nutrient content in soils between sett and latrine areas (see: Platt et al. 2016). This indicates a need for more comprehensive investigations, including soil-mixed areas (burrows) and fertilized areas (latrines). The main problem of this research is to define what kind of disturbance caused by badgers (soil mixing or fertilization) is more relevant for shaping plant species diversity among setts and latrines. Badgers’ setts are known as places that focus plant species diversity (Kurek et al. 2014a, b; Kurek and Cykowska-Marzencka 2016) but the question is whether latrines as fertilized areas may also influence soil conditions and how does it contribute to plant species diversity? I put following hypotheses: 1) despite fertilization effect, latrines as small patches with low topsoil mixing are not focal places for plant species diversity and 2) topsoil mixing caused by badgers is a more relevant factor in shaping plant species diversity than fertilization. The study was carried out in the Kampinos Forest, one of the biggest (ca. 385 km2) and best-preserved lowland forest complexes in central Poland. It is situated in the Vistula River Valley, NW of Warsaw (52.26° to 52.40° N, 20.28° to 20.88° E; 68 to 106 m a.s.l.). As in other parts of Poland, transitional climate (with continental and marine influences) prevails. It is characterized by high variability of weather conditions across months and years. The growing season lasts on average 185 days, mean annual temperature is 7.7 °C, and average annual precipitation is up to 547 mm (414–693 mm) (Andrzejewski 2003). The dominant substrate is sand of glaciofluvial and fluvial origin. Therefore, prevailing soil types are podzols and arenosols. A large part of the sand is wind-transported and forms dunes overgrown mostly with Scots pine (Pinus sylvestris L.) and mixed forests with Sessile oak (Quercus petrea (Matt.) Liebl.). The wetter interdune depressions are dominated by fens and forests with Alder (Alnus glutinosa (L.) Gaertn.). Badgers’ burrows and latrines were surveyed over the whole forest area during years 2009–2011. The burrows were identified as being inhabited by badgers by tracks, evidence of burrow-cleaning methods, paths, and direct observations of animals (Kowalczyk et al. 2000; Panek and Bresiński 2002; Kurek 2011). Only breeding sites (well-developed setts covering up to 0.1 ha used for several, in some cases even for 40 years – personal observations of forest staff) were taken into account in this study. The 20 best-developed burrows that were in use as breeding sites and 20 latrine plots situated in similar habitat types (pine or mixed oak-pine forest) were selected. Each selected latrine plot (hereafter: latrine, n = 20) had minimum three well developed dung pits, that covered at least 60% of the plot area. In this way two pairs of research objects were distinguished: (1) latrines (n = 20) and their reference plots (n = 20), (2) burrow mounds (n = 20) and their reference plots (n = 20) which makes 80 plots in total. Burrow mounds and latrines represented two different types of disturbance (topsoil mixing on burrow mounds and fertilization in latrines). Not disturbed reference plots versus burrow mounds and latrines (disturbed areas) represented a second factor: disturbance presence. The soil samples were collected only from dung pits which were used several times (not from temporary defecation sites nor foraging pits) during the season and moreover from those that were in use from 2009 when the latrines’ survey had started. To eliminate replication of the data the latrines situated on the badgers’ burrows were excluded from investigation. All data was collected on circular plots (1 m2). Soil samples representing fertilized areas (latrines) were collected from the bottom of dung pits and from paired reference areas. At each burrow site, soil samples were collected from dome-shaped soil mounds formed at burrow entrances (bare ground without a litter cover, covered however with plants) and their paired reference areas. Reference areas to latrines and burrow plots were situated 10 m away in a random direction with the forest floor not visibly affected by animals (no soil mixing nor fertilization). After removal of the O horizon (if present), topsoil samples were taken with a corer (ø 3.5 cm) up to 10 cm depth. Samples were collected in summer to avoid the effect of precipitation (dilution effect after wet spring) on nitrate content. In general, soil samples were collected at three spots and bulked to one composite sample. In the case of latrine plots only one soil sample was taken from each dung pit. Before chemical analysis all soil samples were sieved through 2 mm mesh. Soil suspension pH was measured electrometrically following extraction with H2O (1:5 w:v). The content of total N was determined with a method based on Kjeldahl digestion using a Kjeltec 2300 (FossTecator). Ion chromatography was applied to estimate the content of NH4+ and NO3−. NH4+ was determined with Dionex 100 and NO3− with Dionex 1100. For each research plot the abundance of herbaceous plant species in the field layer was estimated on the Braun-Blanquet scale. For further CCA analysis Braun-Blanquet scale was transposed after van der Maarel (1979) – coded 1–9, where 1 was assigned for “r”, 2 for “+”, 3 for “1”, 5 for “2”, 7 for “3”, 8 for “4”, 9 for “5”. To detect the effect of burrow environment on plant species communities some eco-functional groups after Frank and Klotz (1990), Grime et al. (2007) and BiolFlor Version 1.1 (www2.ufz.de/biolflor/info/version.jsp) were distinguished which considered: life history (perennial, annual), dispersal mode (anemochory, endozoochory, myrmecochory, epizoochory), affiliation to specific habitat type (disturbed habitats, non-forested areas, coniferous forests, deciduous forests), soil seed bank type (t0 – transient seed bank, seeds germinating in autumn, t1 – transient seed bank, seeds germinating in late winter or spring next year, t2 – a small amount of seeds persisting in the soil, often for more than 5 years, t3 – large bank of long-persisting seeds). Classification presented above is simplified in comparison to the original classification, i.e. all Gramineae species were classified as anemochorous instead of mixed type anemochorous/epizoochorous. The other species that presented mixed strategies with no clearly defined dispersal mode were excluded from consideration. Nomenclature of herbaceous plants follows Mirek et al. (2002). Data were analysed with repeated measures ANOVA performed with Statistica 9 (Statsoft Inc.), Chi square test with R v2.13.1 (R Core Development Team 2016) and CCA analysis with CANOCO 5 (Šmilauer and Lepš 2014). Prior to ANOVA analyses, the data was transformed with logarithmic or exponential functions to obtain a normal or at least symmetric distribution. Repeated measures ANOVA were used to examine the presence of disturbance effect (mounds and latrines vs. reference plots) and the type of disturbance effect (burrow mounds vs. latrines) on soil chemical properties and on flora parameters. I used repeated measures ANOVA because both factors considered in the analysis were paired with reference plots. The Chi square test (χ2) was used to check the share of plants’ functional groups such as: life history, dispersal mode, affiliation to specific habitat type and persistence of soil seed bank between plot types. Computations were provided for Tables 2 × 4 (life history) and 4 × 4 (dispersal mode, affiliation to specific habitat type, soil seed bank type). An ordination analysis performed with canonical correspondence analysis (CCA with default settings) was used to disclose relationships between plot types and to summarize the part of the variation in species composition explained by environmental variables (pH, N%, NO3−, NH4+). Herbaceous plant species occurring in less than five plots (less than 6.25% of plots) were treated as accidental records and were excluded (53 rare species) from further CCA analysis (but considered in other statistical analyses). Such approach eliminated the potential influence of occasionally occurring species and reduced the number of variables in comparison to the number of samples. This made computation results (finally based on 31 of total 84 species) of data-rich tables easier and clearer for further interpretation with no negative effect on further conclusions. The highest values of pH were detected both on burrow mounds and in latrines (Table 1, Fig. 1). The pH did not depend on the type of disturbance, thus values on burrow mounds and in latrines were similar. Both type of reference plots with intact topsoil had lower pH values than disturbed plots – burrow mounds and latrines. The total nitrogen content decreased significantly on burrow mounds constructed from bare soil without organic matter, while latrines exhibited similar values of total N as reference plots. As a result, the content of total N was affected by presence of disturbance × type of disturbance interaction (Table 1). There were opposite proportions observed in the case of ammonium and nitrate in the soils of mounds and latrines with no differences between both groups of reference plots (similar habitat conditions). NH4+ content was higher in latrines than on mounds. In the case of mounds, the content of NO3− was higher in comparison to latrines (Fig. 1). Total 84 herbaceous species were listed (Appendix Table 2) on all four types of research plots (burrow mounds and their reference areas, latrine plots and their reference areas). Exclusively on mounds 23 (total 61) species were recorded, further 7 exclusively on latrines (total 40) and 3 species respectively (total 40, 34) on each control plot. The highest mean number of herbaceous plant species was recorded on burrow mounds (Table 1, Fig. 1). The herbaceous species richness in latrines and in reference plots was lower than on mounds. Plant species characterized with traits allowing them to settle on habitats with mixed topsoil were recorded at a higher number (however, not in each case confirmed with statistical significance) on burrow mounds (Fig. 2). It was manifested in: 1) higher number of annual plant species (χ2 = 3.82, df = 3, p = 0.2820), 2) higher share of anemochorous plant species (χ2 = 2.35, df = 9, p = 0.9847), 3) higher number of ruderal plants (χ2 = 16.00, df = 9, p = 0.0668), 4) higher share of plants with persistent (t2) soil seed bank (χ2 = 5.08, df = 9, p = 0.8270). CCA (gradient length = 5.8) distinguished one aggregation of plant species associated with burrow mounds. Other plant species were dispersed with no clearly separated aggregation (Fig. 3). It seems that the most characteristic plants related to soil heaps on burrows are i.e. : Chelidonium majus, Geranium robertianum, Geum urbanum, Holcus lanatus, Impatiens parviflora, Mycelis muralis, Urtica dioica and Viola reichenbachiana. These species form an assemblage connected with soil mixing (right down on Fig. 3) with higher content of NO3− and more alcaline soils (higher pH). The rest of plant species were occurring on latrines and reference plots which form mixed assemblage. Four axis explained 17.7% of variability (sum of eigenvalues: 0.9328). First and second axis explained 9.5% and 3.4% of variability (eigenvalues: 0.5165 and 0.1849). The effects of fossorial ecosystem engineers are known from many regions where essential resources are spatially and temporally limited (Bruun et al. 2005; Eldridge and Koen 2008; Sierra-Corona et al. 2015). There is clear evidence that similar processes take place also in temperate regions in Europe (Obidziński and Głogowski 2005; Obidziński and Kiełtyk 2006; Kurek et al. 2014a, b; Rola et al. 2017). Badgers may affect plant communities in two ways (see: Boeken et al. 1998): 1) by releasing locally existing resources as a result of soil mixing and 2) by delivering exogenous resources with their manure. The first factor has a stronger effect on burrows and the second one seems to play a more important role in latrines. Animal activity, i.e. digging burrows and fertilization in latrines, influence soil chemical properties in different ways thus flora response is different between these two sites. Present study confirmed that burrow mounds were characterized by higher pH and lower content of total N in comparison to latrines and reference plots. 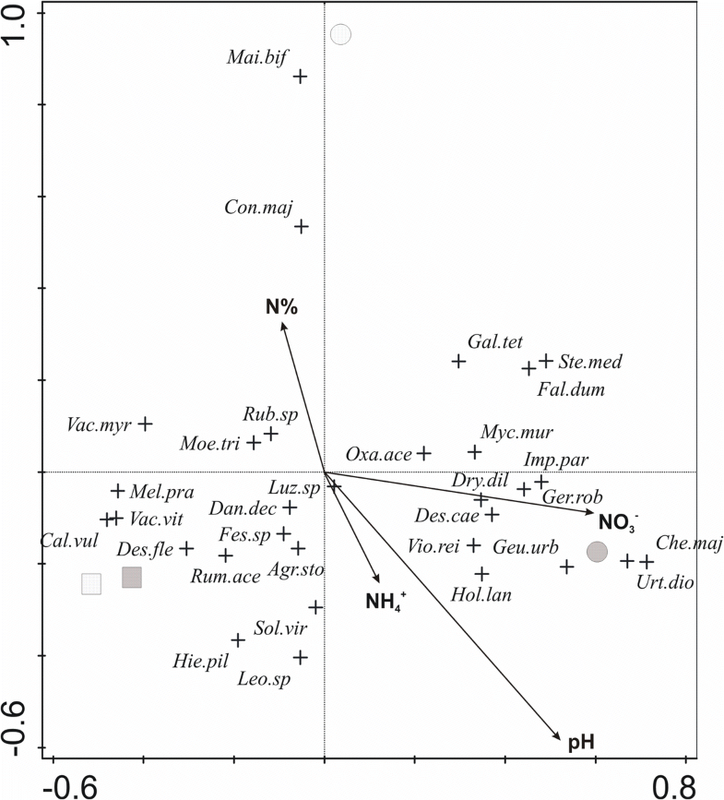 The pH usually increases on the mixed soils (Canals and Sebastiá 2000; Kurek et al. 2014a, b) and total N decreases since lower layers in the soil profile excavated by burrowing animals are nitrogen poor (Kurek et al. 2014a, b). As expected the content of the main component of manure (NH4+) was higher in latrines than on burrow mounds where the content of NO3− was higher. Some authors also reported, that in spite of a total N decrease, these two forms increased while soil was mixed (Canals and Sebastiá 2000). As some authors suggested (Van Wijngaarden and van de Peppel 1964; Stubbe 1965; Neal and Roper 1991; Neal and Cheeseman 1996), urine and feces deposited by badgers may increase nitrogen content in the mounds’ soils. Badgers may leave their excrements at the entrance to burrows (Roper et al. 1986; Hutchings et al. 2001; Buesching and Macdonald 2004), but it seems that they do so very rarely (Kurek P. – pers. obs.). Thus, such explanation should be excluded due to the lack of relevance. It is worth mentioning, that higher content of NO3− was detected on mounds. It suggests that enhanced nitrification must be responsible for the significant increase of nitrate in the mounds reported by many authors (Platt et al. 2016). Mixing of soils on the mounds may influence the aeration rate and enhance nitrification especially (Ross and Hales 2003). According to Lambers et al. (2008) anaerobic soils limit this process. Apart from oxygen access, nitrification requires slightly alkaline pH (Day et al. 1978). Increased pH value stated on mounds’ mixed soils in these investigations seems to foster nitrification process. Generally, it results in an increase of NO3− concentration (Kaur et al. 2010) even for longer periods (Ross and Hales 2003). Increased nitrification caused by soil mixing on burrow mounds may be a crucial process that improves conditions for establishment and growth of more demanding plants. Latrines were characterized with higher content of ammonium NH4+. Feces and urine are deposited within them usually throughout the year (Hutchings et al. 2001). Latrines, similarly to other animal generated pits, may also act as litter traps characterized by different physical and chemical conditions than undisturbed surrounding area (Eldridge and Mensinga 2007; Eldridge and Whitford 2009). Especially in dry and arid ecosystems the capture of litter and its decomposition within these pits is a very important process moderated by soil-disturbing animals (Eldridge and James 2009). Higher content of ammonium – a main component of urea (Kirchmann and Pettersson 1995), could be explained by higher input of excrements to the latrines. Methodological limitations of this research (soil sampled only once) need stronger evidence based on repeated sampling to estimate changes in NO3− and NH4+ content during the season. The effects of soil mixing by mammals result in soil patchiness that supports qualitatively and quantitatively different plant communities within the matrix landscape in which the patches are imbedded (Whitford and Kay 1999; Ballová and Šibík 2015). Soil disturbance by fossorial animals leads to a variety of responses by plant species composition, i.e. in species richness, biomass, plant abundance and plant density (Alkon 1999; Whitford and Kay 1999). 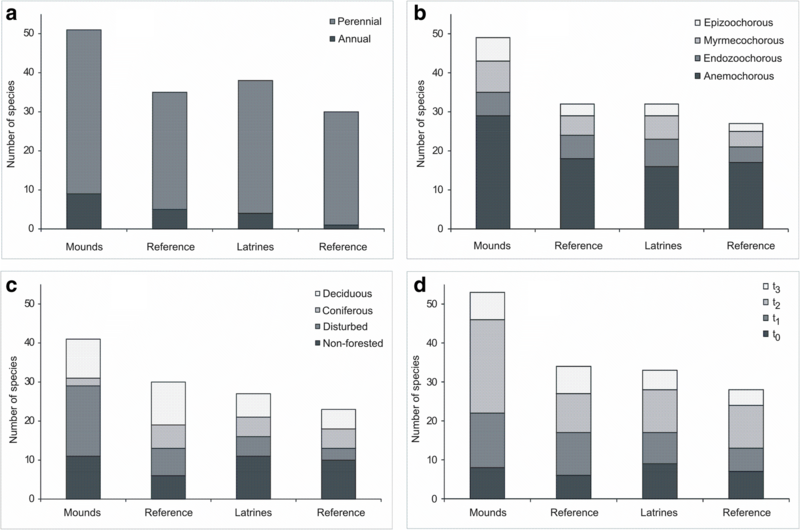 Usually, such disturbing activity as digging is reported to have a very positive effect on herbaceous species richness in a wide range of latitudes (Bruun et al. 2005; Obidziński and Głogowski 2005; Obidziński and Kiełtyk 2006; Kurek et al. 2014a, b; Sierra-Corona et al. 2015), also including the possibility of establishment and spread of exotic plant species (Kotanen 1995; Whitford and Kay 1999; Kiełtyk and Mirek 2015). Results presented above confirm that soil heaps on badgers’ setts have a higher plant species richness and diversity. Generally, most authors reported that the effects of pedturbation by mammals reduce perennials and provide patches suitable for settlement by annual forms (Kinlaw 1999; Whitford and Kay 1999). Annuals, also annual exotics, gain advantage and may develop on disturbed areas (Kotanen 1995; Boeken et al. 1998; McIntyre et al. 1999; Whitford and Kay 1999). Periodically and continually disturbed environments are usually colonized and dominated by annual plants (Symonides 1988). Present study revealed the increase of total plant species diversity on burrow mounds. Mounds in this study were the places where plant species characteristic for disturbed habitats mostly occurred. And thus, badgers’ digging activity promotes establishment of plant species resistant to pedturbations. Soil mixing on burrow mounds resulted in higher share of anemochorous species, annuals, terophytes and species characterized by persistent soil seed bank among plants assemblage. Life history type (plants with annual or perennial life cycle) linked to other ecological traits (i.e. : forming persistent soil seed bank) is considered to be a strong indicator of soil mixing (McIntyre et al. 1999) due to the tendency of annuals or short-lived perennials to be favoured by such disturbances. Shorter life histories are correlated with increased soil seed bank persistence (Thompson et al. 1998). It seems that burrows promote establishment of plant species attributed with long-lived soil seed bank connected with soil-mixed habitats. One of the results that confirmed the hypothesis favouring soil mixing effects rather than fertilization is the concentration of plant species with persistent soil seed bank and higher resistance to soil disturbance generated by digging activity of animals. Some differentiations in plant composition between plots was also confirmed by ordination analysis (CCA). CCA analysis distinguished aggregation of herbaceous plants associated with burrow mounds, i.e. : Chelidonium majus, Geranium robertianum, Geum urbanum, Impatiens parviflora, Mycelis muralis, Urtica dioica, Galeposis tetrahit and Fallopia dumetorum. It clearly seems that these species form an assemblage connected with soil mixing gradient, increasing pH and content of NO3− that run from right to left on Fig. 3. The rest of plant species occurring on latrines and reference areas formed mixed assemblage. Some authors consider animal generated pits as places convenient for germination, higher seedling density and higher biomass yield (James et al. 2010, 2011), in some cases also higher species diversity (Alkon 1999), but see: James et al. (2011). Indeed, any kind of pits (i.e. dung pits/latrines, foraging pits) are crucial for plant renewal which, i.e. in arid zones, are acting as fertile patches with water accumulation (Alkon 1999). In this research latrines did not stand out with plant species richness in comparison to environmental background so distinctly as burrow mounds. Interestingly, plant species richness in the vicinity of latrines did not seem to be affected by higher nutrient input with urine and feces deposited by badgers. It suggests that latrine pits in temperate forests did not play as relevant role in shaping plant community, plant species richness and chemical processes as in the arid zones (Alkon 1999; Eldridge and Mensinga 2007; Eldridge and Whitford 2009; James et al. 2010; James et al. 2011). Another relevant conclusion is the fact that fertilization by badgers is not a sufficient factor for the development of so called nitrophilous plants in the vicinity of latrines. Basing on the results presented above a question arises: why in such convenient conditions prevailing in latrines there were no positive effects on species richness in plant communities? The reason for this lies in spatial and temporal characteristics of latrines. Latrine, a small funnel-shaped pit, works as a nutrient rich spot and usually covers small areas. Soil seed bank is poor in coniferous and sandy habitats, so any changes in plant communities seems to rely only on seed import. The second limitation is the temporal functioning of latrines – in this research was stated that after three years the latrines almost completely disappear. Research on succession indicated that seed input was influenced by the modes of dispersal and depended on the area colonized and on the distance to the nearest diaspores source (see: Dzwonko and Loster 1992). In these circumstances, despite convenient conditions for plants to grow, it seems that there is low probability and possibility for seedling establishment in such ephemeral and small patchy habitat as badgers’ latrines (in comparison to large and persistent mounds of excavated soil from burrows). Most authors speculate that the main factor responsible for the differences in plant species composition in the vicinity of badgers’ burrows is a result of enrichment of the setts via scats and urine (Van Wijngaarden and van de Peppel 1964; Stubbe 1965; Neal and Roper 1991; Neal and Cheeseman 1996). Usually they did not measure the content of nutrients in the soil. If the input of nitrogen is the main factor that affect plant community, the latrines should display higher share of nitrophilous species. This research did not confirmed it. Flora and soil chemical properties show that badgers may shape plant communities not by fertilization with urine and feces, but by altering soil properties as a result of digging activity. Plant community from burrow mounds formed assemblage consisting of disturbance-resistant plants species characterised with persistent soil seed bank and also with higher nutritional demands. The occurrence of plants with high nutritional demands (i.e. Urtica dioica) on burrow mounds in this research and also reported by many authors (Van Wijngaarden and van de Peppel 1964; Stubbe 1965; Neal and Roper 1991; Neal and Cheeseman 1996) seems to be a result of the release of locally existing resources and higher nitrification rate rather than fertilization by manure input. In consequence, a relatively high supply of nitrate NO3− on mounds may result in the occurrence of some nitrophilous plant species (Taylor 2009). This may cause a false impression of fertilization by animals as a main factor. I am grateful to the Director of Kampinos National Park, for enabling me to conduct the research. I am also grateful to Blanka Wiatrowska and Tomasz Święciak for their help in carrying out the field work, to professor Maria Wojterska for improving the first version of the manuscript and to Fiona Milne-Rostkowska for the final language correction. The study was supported by the Polish Ministry of Science and Higher Education through the Programme for Young Scientists and Doctoral Candidates under a grant for 2012.